Building on decades of successful high volume transfer press experience, Winzeler Stamping Company is a trusted and reliable source for one of the industry’s most complete offerings of couplings, ferrules, and fittings for variety of fluid handling applications. Our Coupling & Ferrule Division continues to meet emerging needs around the world with high performance, cost-effective products. Our appliance couplings, garden hose expansion couplings, machined barbed fittings, and brass ferrules are stocked in industry standard sizes and are available for immediate shipment to your location. All of our stamped and composite stamped/machined lawn and garden hose couplings have been thoroughly tested and analyzed by an independent laboratory and are compliant with the current lead-free water legislation in California (AB1953) and Vermont (S.152). 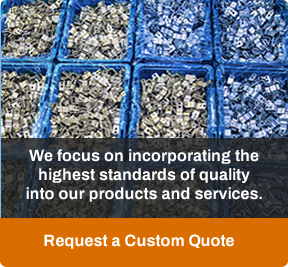 Our products also meet or exceed the guidelines associated with NSF/ANSI Standard 61 -Annex G.
Need a quote? Contact us or use our online quote form today!